Monks and nuns have been living a quiet hidden life in praise of God and service of the church for centuries. God knows each one by name, but history records only the names of some. Among these are some of the most beloved saints in the church. Called the “grandfather” of Christian monks, St. Antony of the Desert was born in 251 and died in 350. He is the first Christian monk whose life was written down in a book. When Antony was about twenty years old, his parents died and left him all their wealth. That is when God began to reveal to Antony the monastic way of life. Antony realized that was the very thing his heart was aching to do. He wanted to possess nothing in this world except Jesus Christ. When he had given away everything he owned, Antony visited various holy men to gain wisdom about the spiritual life. He eventually settled down in a solitary place in the desert where he lived until he was nearly one hundred years old. He prayed constantly, worked with his hands, read the bible, and gave to any poor person who visited him. Antony is revered by all ages as a man whose one desire was to know and love God. In the fourth century, St. Pachomius set up large monastic centers that provided a secure alternative to dwelling alone or in small groups as the first monks did in the Egyptian desert. 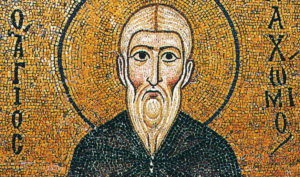 Pachomius was a soldier in the Roman army before his conversion to Christianity and vocational call to monastic life. He had a gift for organizing large groups of monks into a strong, well-functioning unit like an army. Monks were grouped according to the trade they practiced, with an officer over every ten monks, and another over five groups or ten. In this organized way, many hundreds of monks could live together in one compound, gathering for prayer together, then separating into their proper units for work. One unit supplied bread for all, another made shoes, another prepared the common meal. Pachomius also organized two monasteries for women along the same regimented lines. In this way, he opened up monastic life to thousands of devout Christians and is honored as the founder of cenobitic monasticism, a term describing common life. St. Benedict adopted the Pachomian model and modified it. Most monks and nuns today live a common form of life in large or small monasteries. 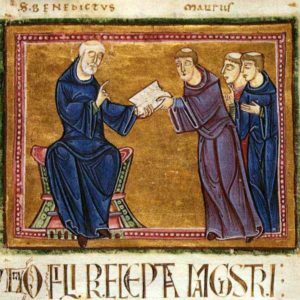 The Rule of St. Benedict (RB) was not the only monastic Rule available in the sixth century, but it was the most livable for people of ordinary strength. From his own experience and from the tradition of Egyptian monasticism, Benedict absorbed the authentic monastic spirit of seeking God in community. He was able to articulate his vision in a rule that is notable both for its Christo-centric spirituality and its practical organization. Charlemagne, the Holy Roman Emperor and his son Louis the Pious in the ninth century established Benedictine monasteries throughout their empire to benefit from the civilizing and unifying effects. In our time, not only monks and nuns but also lay people have discovered the wisdom contained in the RB and try to live accordingly. Born in the year 1091 in Burgundy, France, St. Bernard attained in his lifetime a stature and influence almost unparalleled by any other individual in the history of the church. He was a cloistered monk who owned nothing, held no high office in the church, and no political power in the world, and yet he exercised a fascination over the minds and hearts of the monks he lived with and over persons of every rank and state in life, including priests, princes and even over popes. St. Bernard possessed outstanding gifts as a mystic, a teacher, a pastor of souls and a preacher of God’s word. Born into a noble family, at age 20 Bernard experienced a conversion and gave his life to Christ. So magnetic was Bernard’s personality that his conversion quickly led to the conversion of many family members and friends. When Bernard learned of a monastery at Citeaux where the monks had given themselves completely to silence, prayer and meditation on the scriptures, fasting, obedience, poverty, the renunciation of all personal possessions for the glory of God, he wanted to join. At age 23, Bernard became a monk at Citeaux and brought with him 30 companions. Following his arrival, the new order received a tremendous surge of growth. 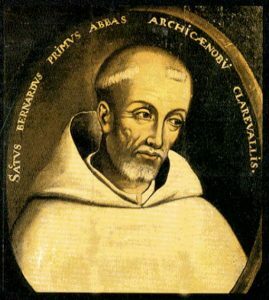 The formidable Abbot Armand Jean le Bouthillier de Rancé (1626–1700) reformed the Cistercian abbey of La Trappe in northwestern France, which eventually gave its name to the Trappist Congregation of Cistercian monks who followed its customs. 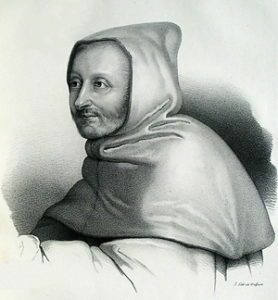 de Rancé’s reforming zeal was that of a wealthy, well-connected cleric who underwent a moral conversion after the death of a close friend, the Duchess of Montbazon. Life under Abbot de Rancé at La Trappe was penitential and brief, with monks dying of tuberculosis in an unhealthy climate. Because some of them died in great holiness, La Trappe was considered the gateway to heaven and attracted many candidates. Rancé resigned for health reasons in 1695 after thirty-one years as abbot and died in 1700. By the middle of the twentieth century and more so after Vatican II, Rancé’s heritage was viewed as a departure from spirit of the 12th-century Cistercian founders. The order was permitted university studies for degrees, use of speech instead of sign language, individual sleeping rooms, improvements in the monastic diet, variations in liturgical and ascetical practices, and work in industries other than farming. Essential components of Cistercian monastic life such as prayer, manual labor, lectio Divina, separation from the world, and the denial of self-will remain in place. What everyone noticed was the change that came over her when she was 18. Little by little she became gentle. Her outbursts of temper disappeared. She became more pensive and austere: more tender and reserved. The spirit of prayerful charity grew in her, togther with a new sensitivity concerning the Church and the needs of the apostolate. She enrolled in “Catholic Action”, a Church-sponsored youth movement. A new depth of receptivity was also born in her, one that hands itself totally over to the will of God. At 21 she decided to consecrate herself to God. Following the guidance of her spiritual father, she entered the Cistercian monastery of Grottaferrata, an economically poor and culturally under-developed community, governed at that time by Mother Maria Pia Gullini. The first and most obvious of these was gratitude for the mercy which God had poured out on her, calling her to belong completely to him. She liked to compare herself to the prodigal son and could only say, “Thank you!” for the monastic vocation, her monastery, the superiors, the sisters, everything. “How good the Lord is!” was her constant exclamation and this gratitude will pervade everything, even the last moments of her illness and agony. The second principle of her life is the desire to respond to God’s grace with all her strength, so that what the Lord had begun in her might be completed and God’s will fulfilled in her, because here is where her true peace lay. 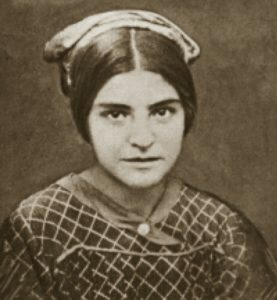 In the novitiate she was afraid that she would be sent away, but after her profession this anxiety was overcome and a peaceful, trusting self-surrender took its place, producing a deep inner drive toward the complete sacrifice of herself: “Now do what You want with me!” she would simply say. Her brief life in the cloister — she lived as a nun for only three and a half years — was consumed simply, like the Eucharist, in her daily commitment of conversion, so as to follow Christ better in his obedience to the Father unto death. Gabriella saw herself as defined by a mission of self-gift: the total handing over of herself to the Lord. By the quick, straight road of her tenacious commitment to obedience, Gabriella attained the inner freedom to be conformed to Jesus, who “having loved his own who were in the world, loved them to the end”. As a counterweight to the laceration of the Body of Christ, she realized the urgency of offering herself and carrying out that offering with faithful consistency until its final consummation. She was conscious of her own frailty, but her heart and her will had only one desire: “God’s Will! God’s Glory!” On the very day of her offering, tuberculosis appeared in her young body which until then had been extremely healthy. It swept her to her death after 15 months of suffering. Even before the consummation of her offering, her self-gift for the sake of Christian Unity had been communicated to the Anglican brethren and had been welcomed by them. It has also sparked a deep response in the hearts of believers of other Christian confessions. The most concrete gift of Sister Gabriella to her own community has been the influx of vocations, who arrived in great numbers during the following years. Her body, found intact on the occasion of its recognition in 1957, now rests in a chapel adjoining the monastery of Vitorchiano, where the community of Grottaferrata has transferred. She was beatified by John Paul II on 25 January 1983 in the basilica of St.Paul outside the Walls. It was 44 years after her death, the feast of the Conversion of St.Paul and the last day of the week of prayer for Christian Unity. 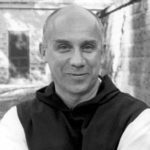 A well-known Trappist of the 20th century, Thomas Merton was born in 1915 and is remembered by many people for a fascinating book he wrote called The Seven Storey Mountain, which tells the story of his conversion as a student at Columbia University in New York City to life as a Catholic and Trappist monk at Gethsemani Abbey in Kentucky. Many men returning from military service after World War II read Merton’s book and were inspired by it to become monks. Because The Seven Storey Mountain made Merton famous, his life as a Trappist monk was unusual. He published books of poetry, was outspoken about the political issues of his day and met with many representatives of non-Christian religions, even becoming a friend of the Dalai Lama. Later in his life, he received permission to build a hermitage on the property behind Gethsemani Abbey where he lived for a few years. In a book called New Seeds of Contemplation, Merton demonstrated his rare gift for writing about his experience of contemplation in a way that engaged and inspired many people to take up the practice themselves. He helped people to realize that they could know God in a direct experience and foster a close friendship with God even amid their busy lives in the world. Staying in a retreat house in Bangkok where he was giving a lecture in 1968, he was found dead under an electric fan which he had apparently touched after stepping out of a shower. He was only 53 years old, and his untimely death was mourned by people all over the world.